Monarch Air Group provides private air charter in Green Bay, WI. Our clients benefit from top-notch service, unrelenting dedication to safety, wide selection of aircraft, and years of experience in chartering private jets. To obtain a free quote, please use our online quoting tool provided below, or call toll free 1-877-281-3051. Monarch Air Group provides private jet charter flights in and out of Green Bay, Wisconsin, USA. Situated at the head of Green Bay, Green Bay is an industrial port city in northeastern Wisconsin. It is situated 112 miles north of Milwaukee and has the population of 104,057 people. 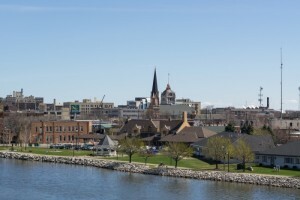 Green Bay is also the third-largest city of Wisconsin and is homeland to the Green Bay Packers of the National Football League. The most notable points of interest include Bay Beach Amusement Park, Wildlife Sanctuary, Brown County Veterans Memorial Arena, Green Bay Botanical Garden, Heritage Hill State Park, Meyer Theater, Neville Public Museum, NEW Zoo, and much more. The nearest airports are Austin Straubel International Airport (GRB / KGRB), which is located 8 miles from the center of Green Bay, and Outagamie County Regional Airport (ATW / KATW), which is located 35 miles from Green Bay. 1. ATW, Outagamie County, Appleton, United States. 2. CLI, Clintonville, Clintonville, United States. 4. GRB, Austin-straubel Field, Green Bay, United States. 5. MNM, Menominee, Menominee, United States. 6. MTW, Municipal, Manitowoc, United States. 7. OSH, Wittman Field, Oshkosh, United States. 8. SBM, Memorial, Sheboygan, United States. 9. SUE, Door County, Sturgeon Bay, United States. 1. Holiday Inn & Suites Green Bay Hotel, 2785 Ramada Way, Green Bay. 2. Holiday Inn & Suites Green Bay Hotel, 2785 Ramada Way, Green Bay. 3. Clarion Hotel, 201 Main Street, Green Bay. 4. Holiday Inn & Suites Green Bay Hotel, 2785 Ramada Way, Green Bay. 5. Clarion Hotel, 201 Main Street, Green Bay. 6. Holiday Inn & Suites Green Bay Hotel, 2785 Ramada Way, Green Bay.